5.0/5 out of 642 votes. The four-leaf clover is the most well known lucky symbol around the world and across many very different countries. Each of four leaf clovers represents one thing. The first leaf is for hope, the second leaf is for faith, the third leaf is for love, and the fourth leaf is for luck. People normally believe that the three leaf clover does not bring luck because it does not include the last leaf of luck. The four leaf clover is a universally accepted symbol of good luck with its origin ages old. According to Christian legend, Eve is said to have carried a four-leaf clover with her when she left the Garden of Eden. That means that anyone who has one can claim to hold a bit of Paradise. The four-leaf clover is mostly their importance as a Celtic charm that has carried forward in modern days to make four-leaf clovers a sign of luck. The four-leaf clovers also occupied a position in the cultural life of early peoples. White clover in particular was held in high esteem by the early Celts of Wales as a charm against evil spirits. 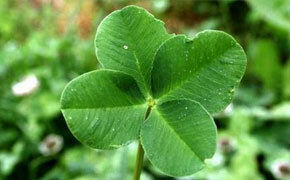 Druids held the 4 leaf clover in high esteem and considered them a sign of luck. The mystique of the four leaf clover continues today, the odds of finding a four-leaf clover have been calculated at 10,000 to 1! If you do find one, you are lucky indeed. since finding a real four leaf clover is still a rare occurrence and omen of good luck.